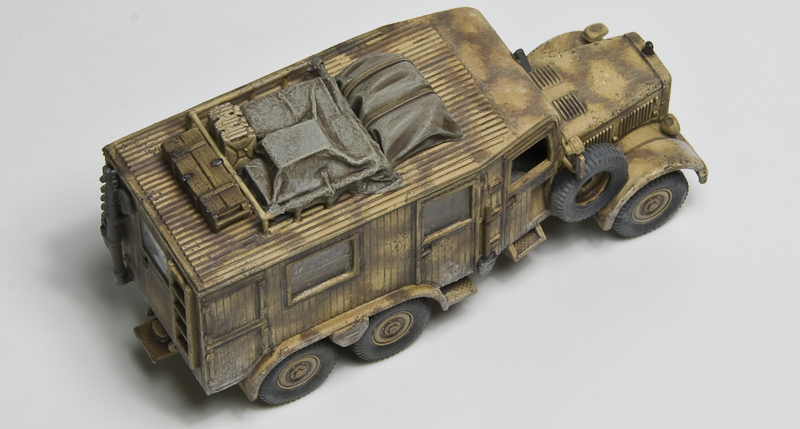 Bruce Weigle is known for his very beautiful and realistic terrain boards. I just found out that he have made a tutorial on how he makes this boards. The boards is intended for 6mm games, but even if we do play our games in bigger scale there is still lots of tips to learn from the tutorial. I have to start with saying that this is mainly for people using SLR cameras. I hope there is something that those of you using pocket cameras and mobile phones will find useful too though. By reading a book about photography or asking a pro you would probably learn something completely different than what I am writing here, I am just telling what works for me! The professional photographer would take this kind of pictures in a studio using expensive flash units. 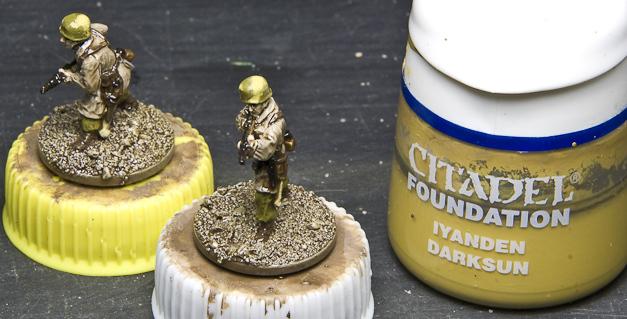 We modellers are spending our money on miniatures, models and acrylic colors so we have to use what we have in our home. This we can do in two ways: using the daylight that are streaming through our windows or by using whatever kind of electrical light sources that we have. Using the daylight can make beautiful pictures, but relying on the sun for taking pictures isn’t the best so I won’t cover that in this tutorial. I do use all kind of lights that we have in our house to take my pictures, sometimes I use the halogen spots above our kitchen work bench, other times I just use the architect lamp on my work desk or the pendant lamp above our dining table – they all work great as long as the shutter on the camera are open long enough. When the shutter is open for more than a split second the picture will be shaken if you hold the camera in your hand. That is why I use a tripod. Tripods can be bought quite cheap and if you are not using it several times everyday I think it is overkill to buy an expensive one. If you don’t have the money or can’t wait to get along with your pictures and starts tonight already then it is also possible to fix the camera with other stuff such as books and boxes or whatever you find that can be useful, but I recommend using a tripod as this makes the session so much easier. Even if using a tripod, then the time the camera needs to take good pictures is quite long, and just by pressing the trigger can be enough to make the picture shaken. There is two way to fix this: the cheapest is to just use the timer in the camera, but to most cameras it is possible to buy a little neat remote trigger, they will probably not cost you that much but gives you the possibility to direct your architect lamp by hand if needed, or holding backgrounds behind the models – things that would be problematic standing behind the camera. Taking pictures for Battle reports. 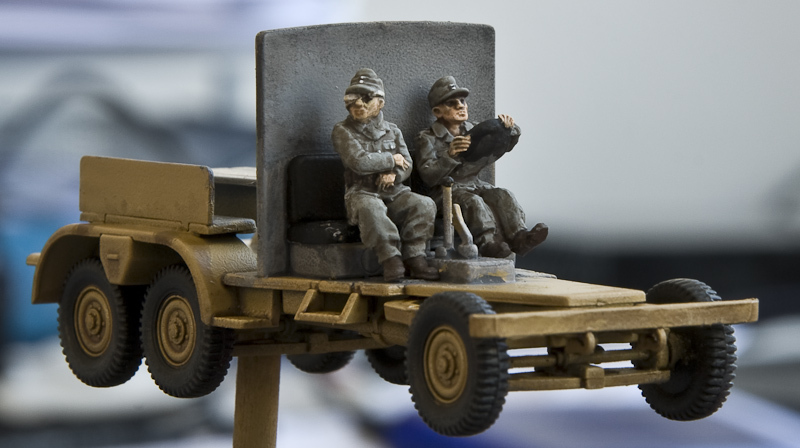 This we do to let the audience see the model and all its details without distraction, preferable on a white background. Usually I let the model stand on a piece of pvc sheet, this gives a blurry reflection of the model that looks quite nice. A piece of paper will work great too, but will not reflect the model. As background I use a piece of card board or whatever I have that is white. 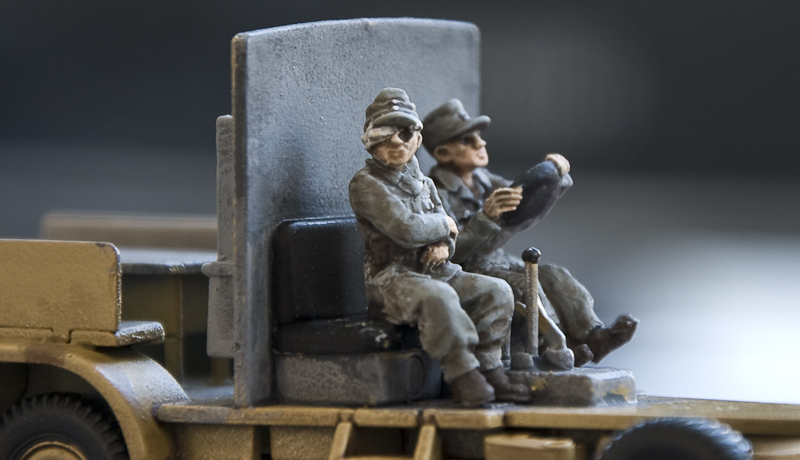 The lighting of the model doesn’t have to follow the rules of the real world with the sun as the only light source. You can place the lamp where ever you want to lid the model, typically you get the best result by put the light source in front of the model to one of the sides, a bit above the model. If you think that one of the sides don’t get light enough you can either use a light source more, or just put up a piece of white paper on the other side of the model and let the light reflect into the paper and down on the model – by looking through the view finder or the monitor (if your camera has one), you will be able to move the paper around to find the best spot for it. A very simple studio. All picture in this article has been shot with this setup – using only the architect lamp on my work desk as light source. A piece of paper is enough to lighten the dark side of the truck. If you want to make pictures of your model that looks like it is in terrain then you get the best effect by trying to light the model as if the sun is the light source. It is important to only use one light source, or at least let one of the lamps be very dominant. If the intention is to mix your picture with a real life image of some environment, then it is important that you use the same strength and direction of the light source as in the image you will mix with, else it will look weird. If the sun is clear in the sky the shadows will be sharp and dark, if it is cloudy the shadows will be blurry and quite light. Don’t be afraid to use strong light that make the highlights very bright and the sides turning away from the light source very dark – this gives a nice effect! 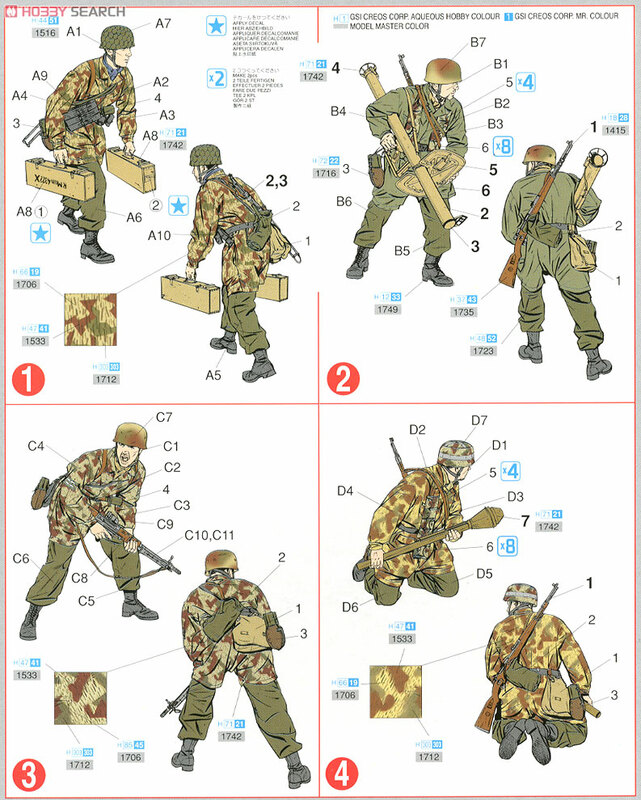 Well, here it is important to make the picture very clear so that it is easy to understand what is happening on the terrain board. If you feel that the camera flash does give you the best result then this is okay, but if you want more realistic lighting I would make sure that the entire board is lighten up with one light direction more dominant than the others. There are some settings you will have to do on your camera to be able to get good quality shots. Every camera has its own menu display and if you can’t find where to change the settings by your self then you have to look it up in the manual. Iso adds grain to the picture and the higher the number the more grains do you get. A very strong light allows you to take a picture without grain, but if the light is bad and the pictures getting dark then you can add grain and make the pictures lighter. A grainy picture can be very cool and used by many to get a special effect. Experiment to find the right amount for your own pictures. All pictures in this article is taken with Iso 100, the lowest possible setting. A very high iso has destroyed this image. Pictures taken inside is often very yellowish. To make sure this isn’t happening you have to fiddle with the white balance of the camera. There are probably pre-installed options called something like: Incandescent, Fluorescent, Direct sunlight, Flash, Cloudy, Shade. If you don’t set the white balance right your image will probably look like the first one. I prefer to set the white balance my self. You will need to find how to do this in your manual. The process will be to take a “test shot” on a piece of grey or white paper that you are holding in front of the lens, and then let the camera do the measurement. If you are going to do retouch in the computer you can easily fix the yellow light later. On the top of the camera, left side, there’s the wheel where you set your exposure mode, on most cameras those are: Auto, Manually, Aperture priority and Shutter priority – we go with the Aperture priority (marked with an A on a Nikon and Av on a Canon). This means that we set the aperture and the camera find the shutter speed for us. The reason to why we want to be able to set the aperture, instead of letting the camera do this for us, is to be able to choose what to be in focus. In Auto mode there will probably be areas on the model that is not in focus, in front and or in the back. But we want the whole model to be in focus and therefore set a higher aperture value. I often use an aperture of f18, you don’t want to go too high cause then the result will be that the overall picture is getting a bit blurry. The higher the aperture is, the longer the shutter time has to be – we use a very high aperture setting and that is why our camera has to be fixed or else the picture will be shaken. If some part of the model still gets blurry after you have set the aperture, there is only one thing to do, move the camera backwards and zoom in. If your pictures are to dark when using the Aperture priority (I have this problem with my old Nikon D80), it is quite easy to take a picture, notice what the shutter speed is and then change the exposure mode to Manually settings, keep the aperture as it is and just decrease the shutter speed until you are happy with the result. When only using the light from one architect lamp my shutter speed usually are 1.6 or 2 seconds. First picture taken with exposure mode Auto. Both the gun and the rear of the model is blurry. Compared to picture two, that is shot with exposure mode Aperture priority (f22), the first picture present itself very bad. But a very high aperture comes at a price, the overall sharpness goes down a bit. Cameras saves your picture as either JPEG (same as JPG) or RAW. JPEG pictures will be smaller and in lower quality than RAW. I alway use RAW as it gives me the possibility to, later on in my computer, zoom in on certain details. 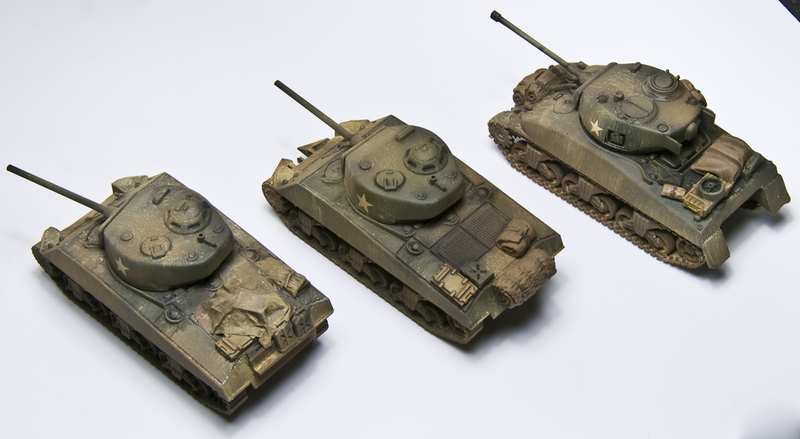 The models in the two pictures above are placed exactly the same place, notice how the second tank looks much bigger in picture two – the only difference is that in the first image the camera is close to the models (wide-angle) and in the second image (telephoto) the camera has been pulled backward (and zoomed in). The knowledge on how to position the camera can be quite useful. It is possible to make more drama in a picture with a high wide-angle. But if you have the camera too close to the model then you will not be able to get the model in focus – move the camera further back and if you want the model to fill the picture then zoom in. 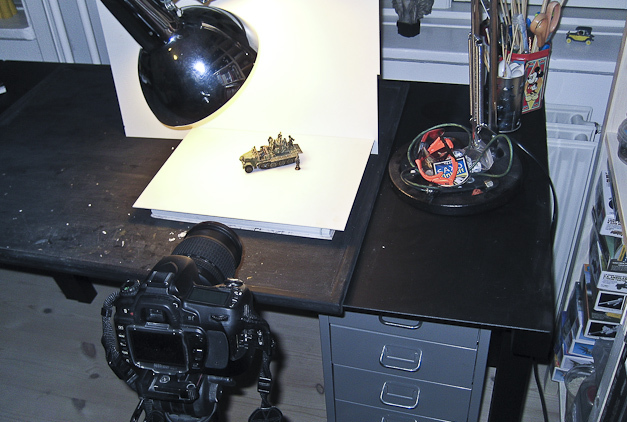 I hope that some of this can help you to make better pictures of your models. If I forgot something or some of it is badly explained then feel free to write a comment. Maybe I later on will write a photoshop tutorial to go with this one. My new idol is named Emmanuel Nouaillier – a french artist that make models that blow my mind! Following pictures says it all (this is 1/72). I was going to start building houses for my La Fière Bridge project, but I just couldn’t find inspiration to get going – until I saw the work of Emmanuel. 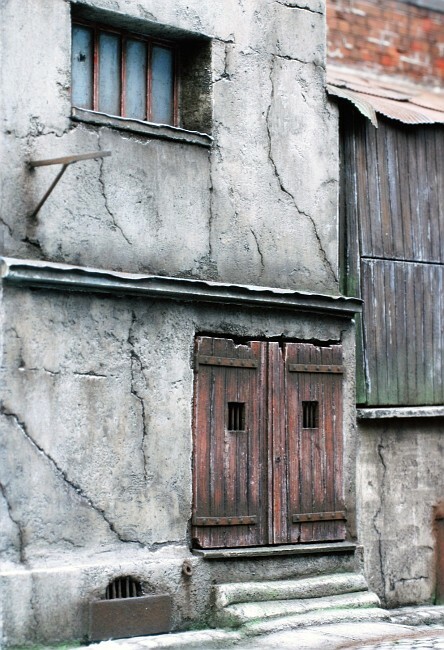 Now I work on my houses for several hours every evening and have ordered silicone for mould-making – so hopefully I will be able to show some examples soon! 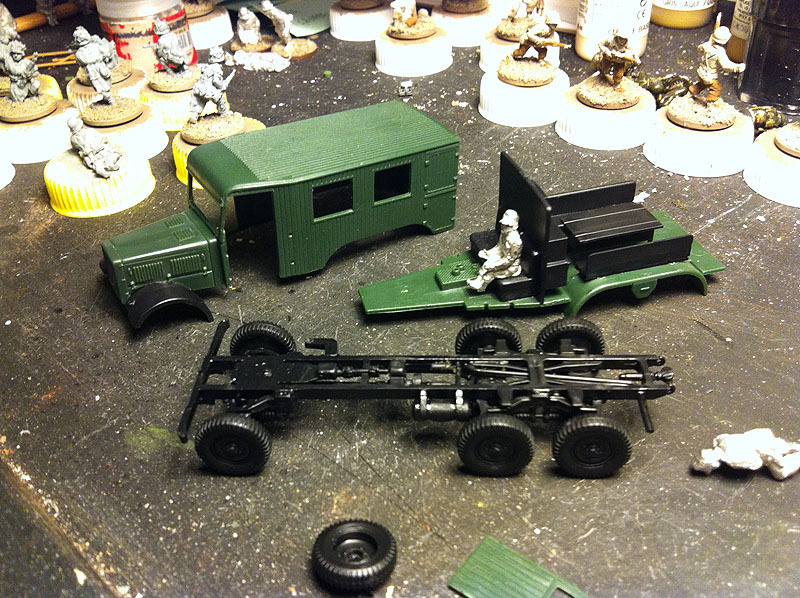 The Guild Forum (my preferred forum for wargaming) started a contest: Build and paint one or more trucks in two weeks! 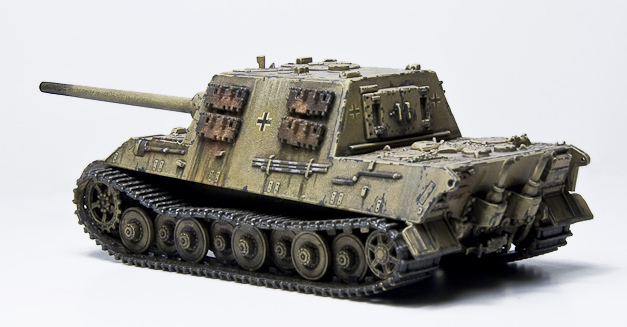 I decided to use the Kfz. 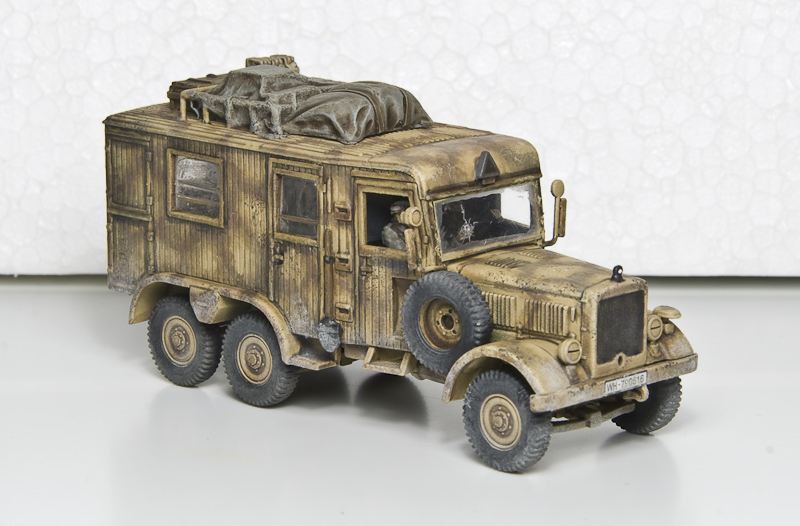 61 Einheitsdiesel from ZV Models for my Normandy germans – even though it is an early truck and that there was probably not many of them still around in 1944. (Sorry for the bad picture quality, most of them I took with my iPhone). 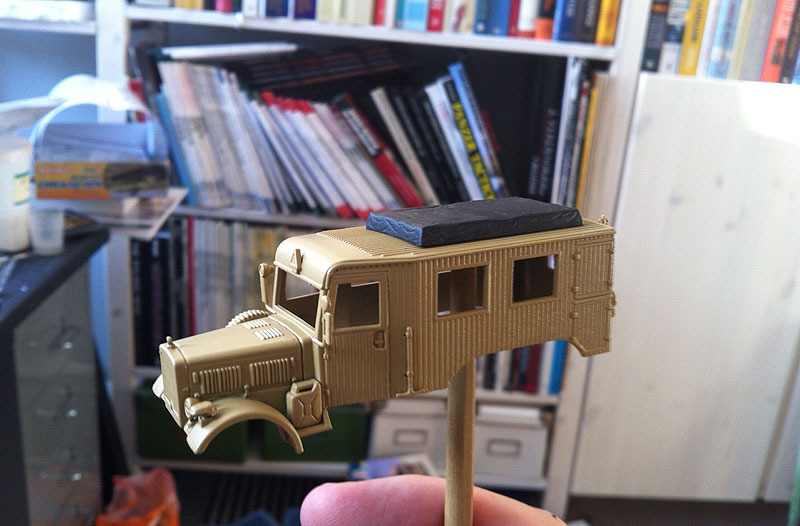 Most of the truck is built now, I am trying to fit the AB Figures into the cabin. The model was really nice to build, everything just fitted so well together. The building instruction was not very good though and I was forced to use reference pictures to get everything right. 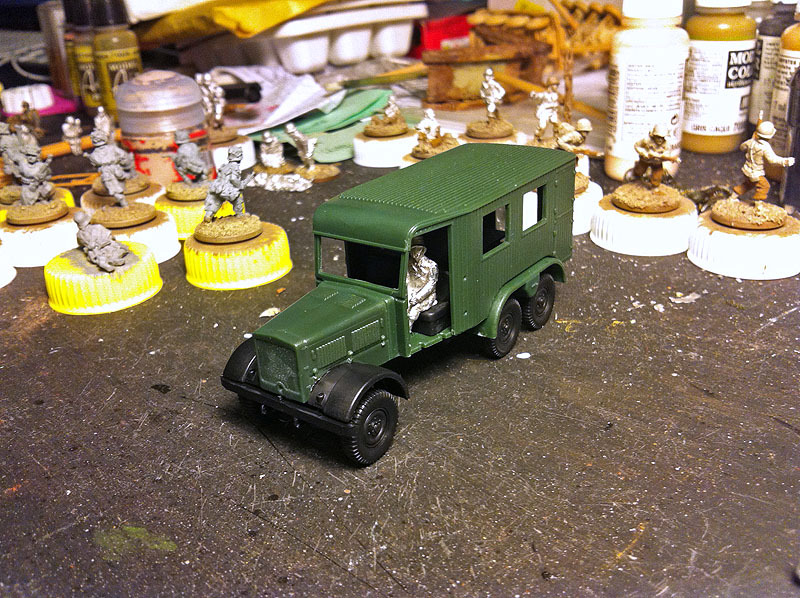 The truck is built and has just been spray painted. 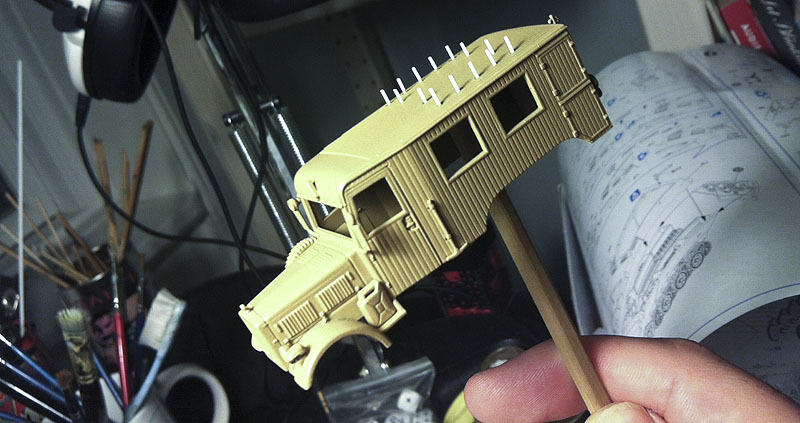 On this model I choose to paint it in two parts so that I could paint the interior before I glued them together. The tarpaulin that comes with the set doesn’t look good at all. It looks more like a skibox than what it is supposed to be. So that goes out and I have to fix something myself. 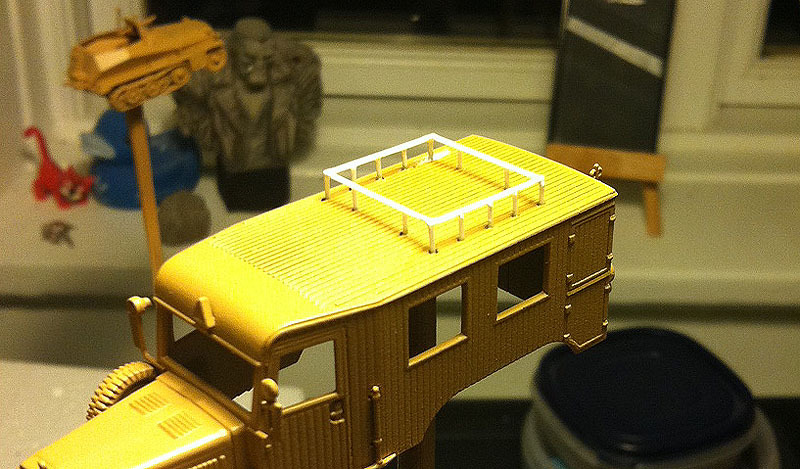 On many pictures of the Einheitsdiesel I have seen a little rail on the roof. I decide to make one for my truck. It was harder than I had expected. The result was ok, but not super. My hope was that a tarpaulin would hide the fact that it isn’t straight all the way around. 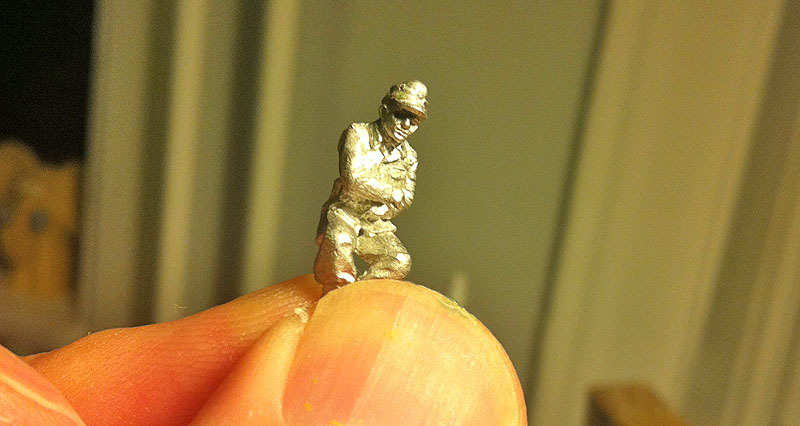 Here I have started converting the figure in the passenger seat. The head will be chopped off. Here the head has been removed and refitted looking the other way. After this I added a bandage to his right eye using Milliput (I can’t understand how people prefer green stuff over Milliput…). 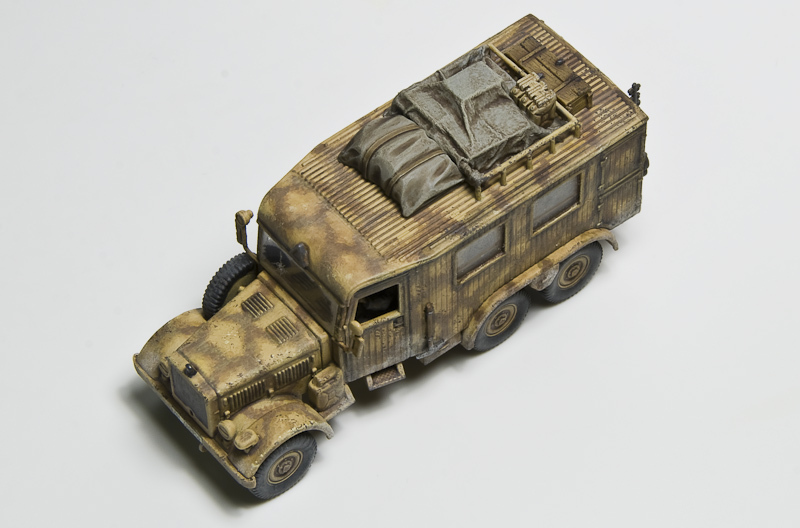 I have never tried to do my own tarpaulins, so I needed to do a test first in case it all went wrong and I destroyed my painted truck. But it was really easy to do. I cut some pieces of thick cardboard, glued them together as if they where boxes lying in a pile. Then I took some thin tissue paper (it was hard to find some that didn’t have patterns in it). The tissue paper I soaked with white glue that was mixed with a bit of water. I put it over the boxes, moved it around a bit until it folded the way I wanted it to, and then I let it dry. I even painted my tarpaulin test to make sure that the acrylic colours didn’t mess it all up. Next up I had to paint the interior of the truck. 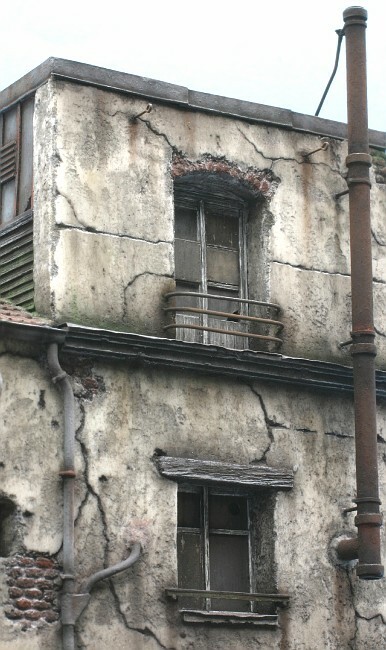 I didn’t use very much time to make this beautiful as I knew that there would be glasses in every window. In the end I found out that even this low level of details was overkill. 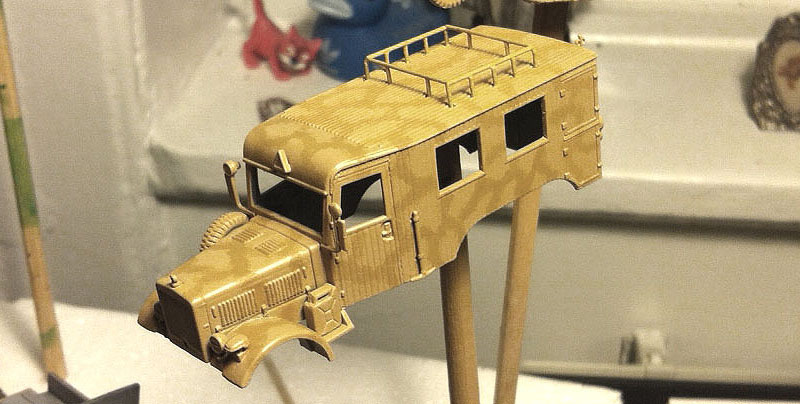 The truck gets the first layer of camo. I wanted to do this with airbrush, but at this moment I hadn’t any (it is ordered and will be received any day now). This is the second layer of camo. I added this layer, and the one before, with a colour mixed with a fair amount of water. This I did so that I could blend it to make it look like it was airbrushed on. 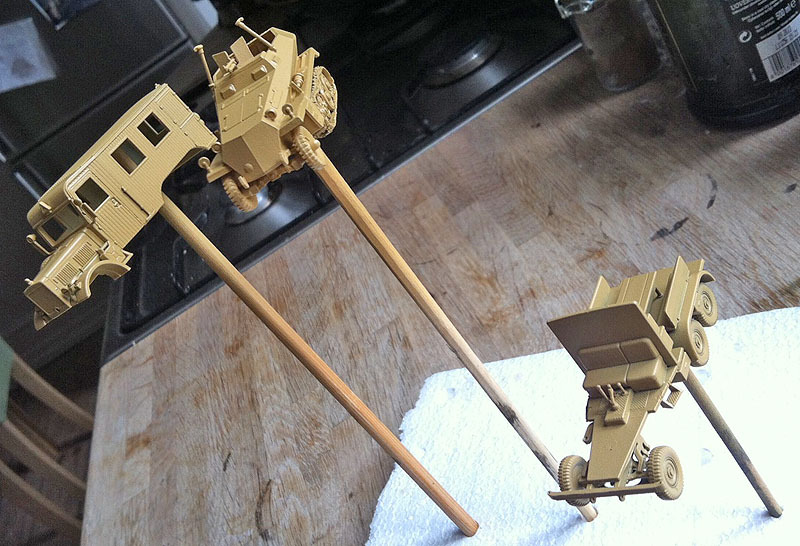 Here I have been giving the truck a wash of Armypainter’s Quickshade. This stuff has a very low surface density and will therefore float down in every depression on the model and make details stand out – the picture don’t show this very well, but it makes a huge difference on the model. After this I gave it several layers of pin washes to highlight details even more. 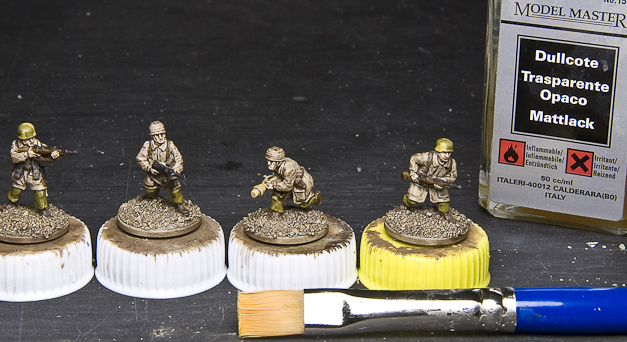 For this I used more of the Armypainter varnish but also GW’s washes (which I think stinks). 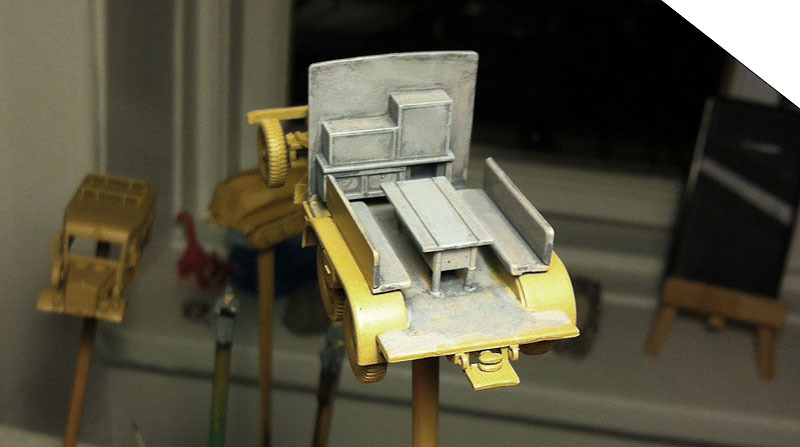 I don’t have any pictures showing the next few steps adding weathering. 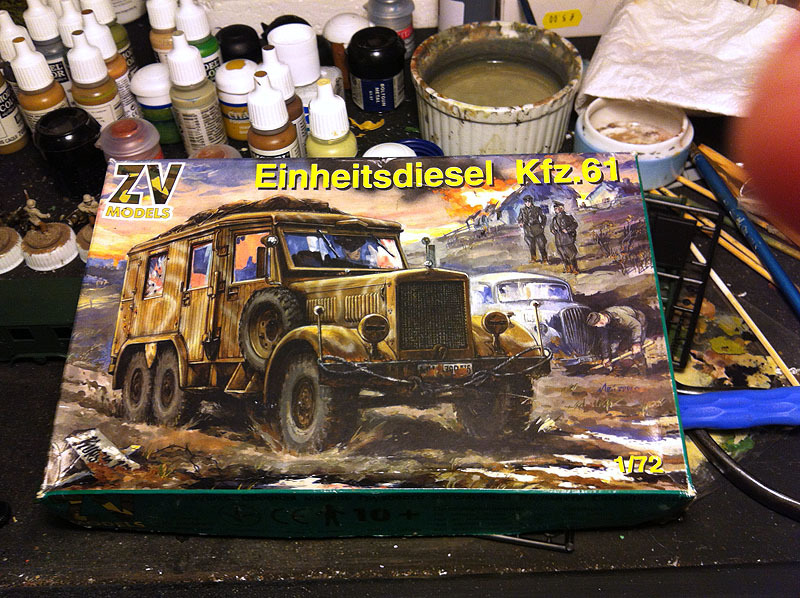 I started with chipping the model, then I added variations in the colour of the truck using oil paints. As the last thing I added pigments to give it a dusty look. 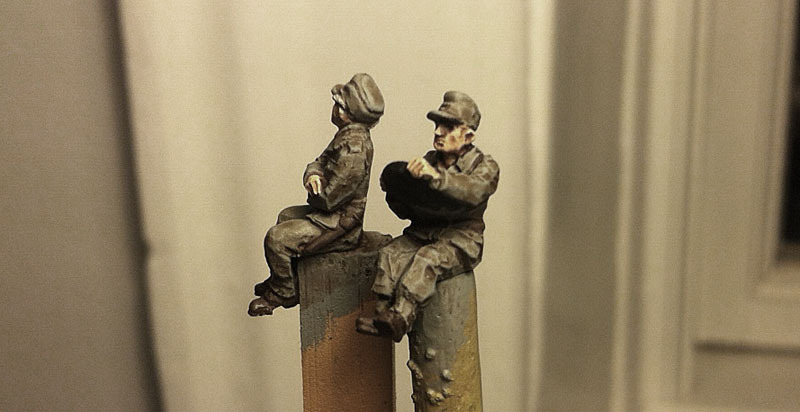 The two figures to sit in the cabin are finished. 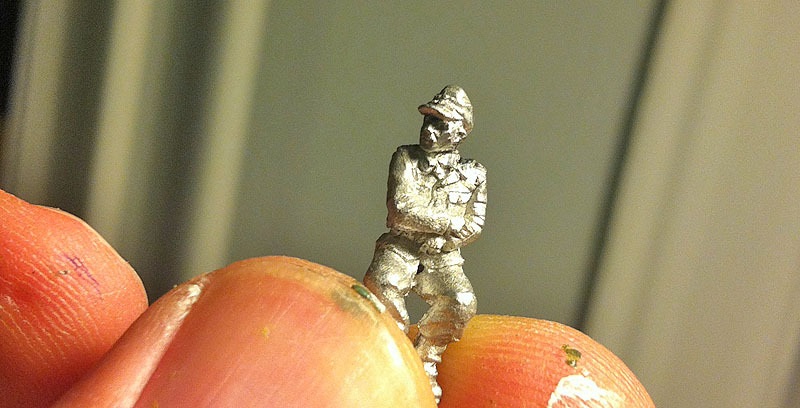 The eyes look very dark, and they are… but do remember that this is only 20mm figures and when holding the model in the hand it looks ok. 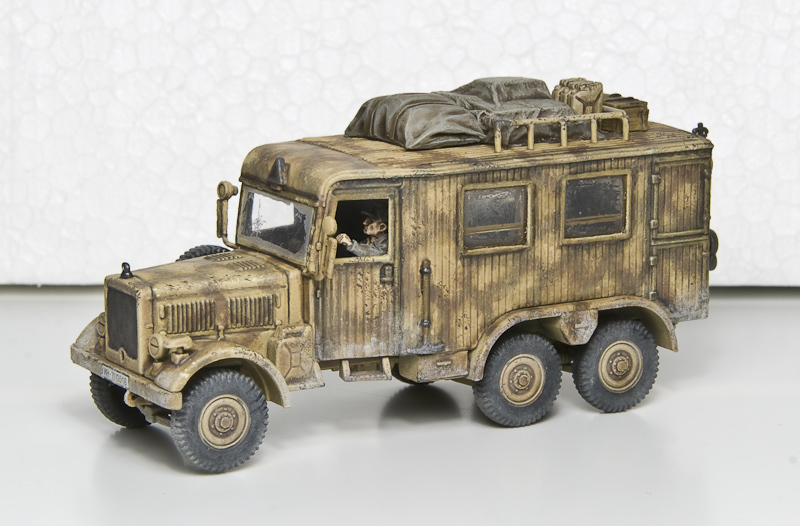 I was not sure if I was going for a figure without the steering wheel and use the one that comes with the set, but I figured that it would be hard to fit the figure with the steering wheel as this sits on the other part of the truck. In the end I cut out the steering wheel and used a figure that was moulded with one. 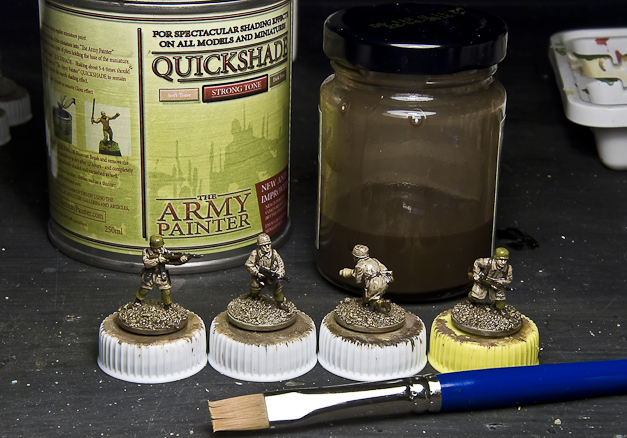 I added some Armypainter Quickshade to the windows to make them look dirty. While it was drying I scratched in the varnish to give it the right look. In this picture the middle wheels are above the surface. It isn’t bad modelling by me, it is actually the surface that bends – the quality of the set is so good that you can’t make that kind of mistakes. I also added some extra jerry cans and a wooden box. This stuff should have been made so it looked like it was fixed to the roof with rope, but I didn’t have the time to do this before I went on holiday with my family. 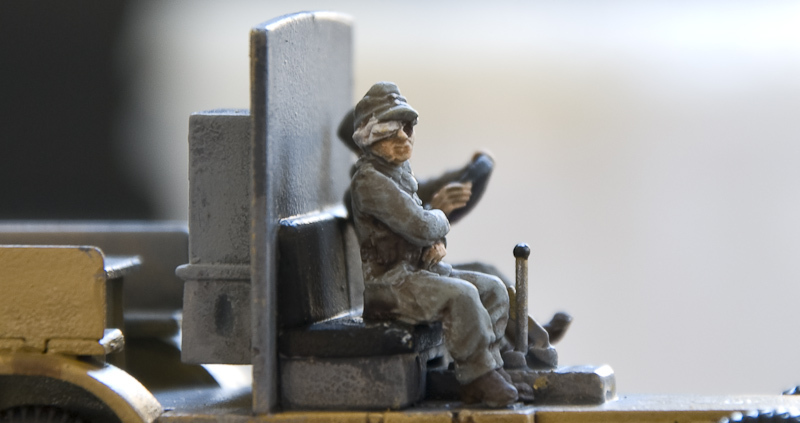 Close up of the driver. Close up of the poor wounded soldier. The hole in the windscreen was easy to do. First I browsed for pictures on what those look like, then it was no problems to scratch the crack into the plastic with a scalpel and after that drill the hole. I did do some tests before doing the final one, though. It is from this picture I got the idea with the bullethole and the wounded soldier. 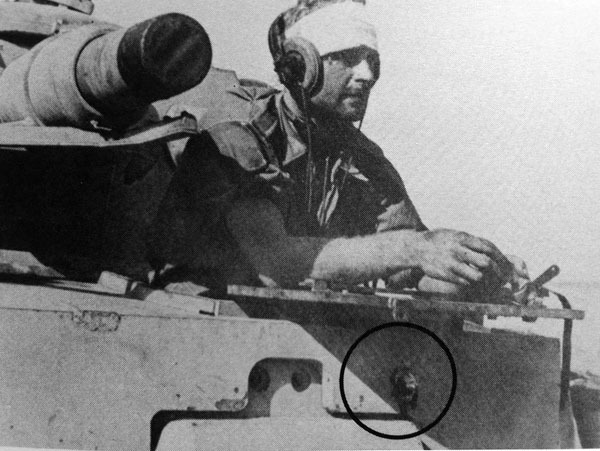 Notice the hole where the AT grenade has hit the tank.